Collaborative robot plug-n-play welding end-effector. That's right, a collaborative robot that welds. 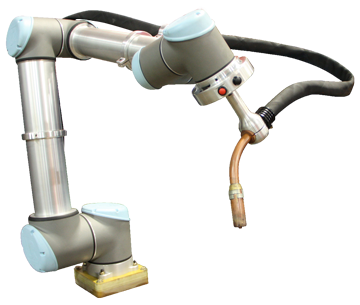 ARC Specialties together with Universal Robots has developed a welding package that eliminates the need for an expensive and complex robotic work-cell because you can use it inside an existing welding booth. The SnapWeld plug-n-play system is controlled directly through your UR teach pendant and even works on the new UR10e, UR5e, and UR3e-Series of cobot. The software interface allows you to control the speed at which you feed wire, the duration of burn back time and gas flow time, as well as crater fill time with real-tem feedback of welding volts and amperage. HTE Automation, Universal Robots and UR+ Partner ARC Specialties, team together to provide Kansas, Missouri, and Illinois with highly versatile Collaborative Robots.